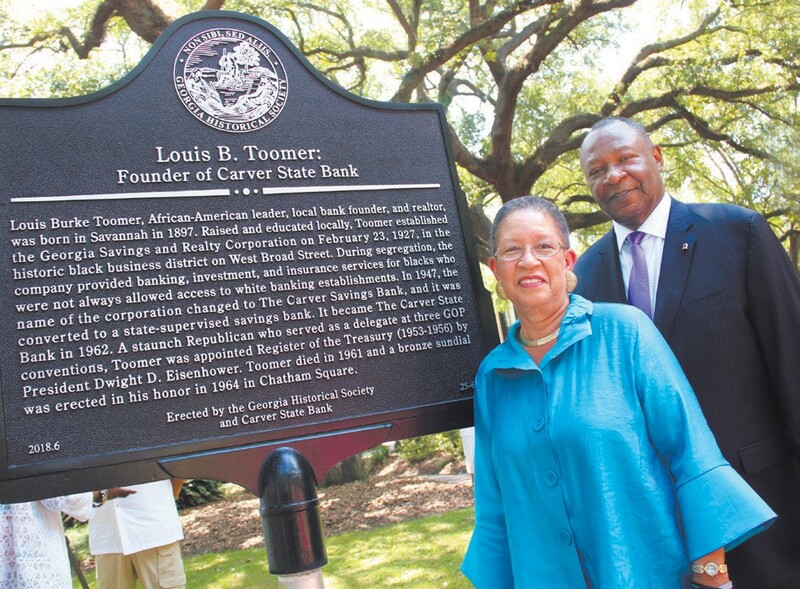 On June 7, 2018, an impressive crowd of Savannah community leaders gathered in Chatham Square to unveil and dedicate a Historical Marker saluting the founder of Carver State Bank, Louis B. Toomer. 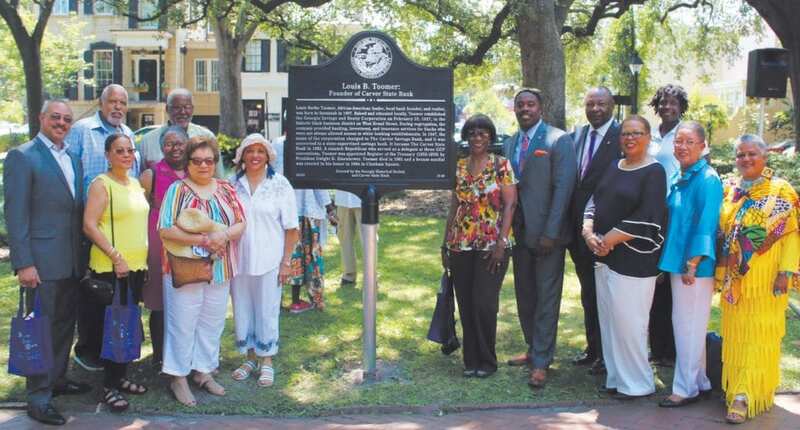 The Toomer Historical Marker is the first such tribute to an African American by the Georgia Historical Society in the Historic District of Savannah. After an opening prayer by Carver Director William E. Stiles, Sr., Carver President Robert E. James, who presided during the program, told the group that he initiated the action to honor Toomer with a historic marker after a pilgrimage in 2016 to the current Sundial Monument honoring Toomer that is also located in Chatham Square. 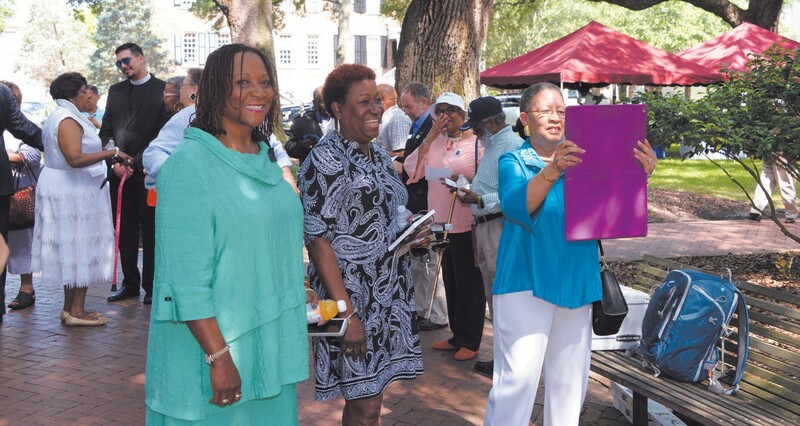 The pil grimage was part of the 27th Annual Savannah Black Heritage Festival and Carver’s 89th Anniversary Celebration. 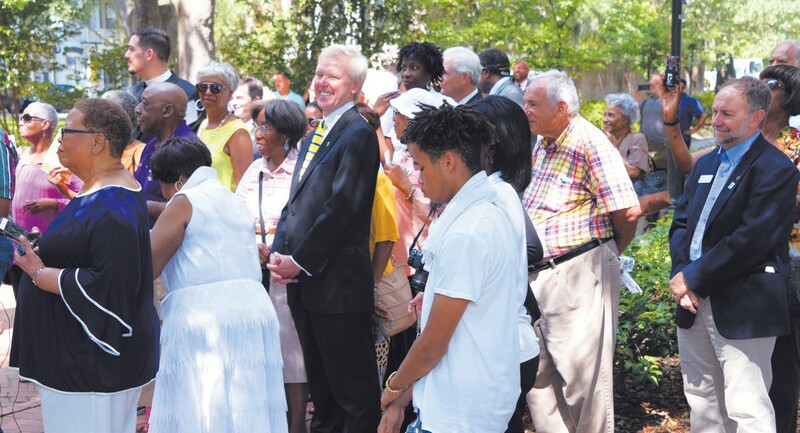 James said that after the pilgrimage, he received several calls from community leaders saying that something more distinctive should be placed in Chatham Square, so that visitors could read about Toomer and his accomplishments. A few months later, the bank commissioned well-known historian, Vaughnette Goode-Walker, to research Toomer’s life and present the idea of a historical marker to the Georgia Historical Society where it was enthusiastically approved. Subsequently, the proposed marker was approved unanimously by the Savannah-Chatham Historic Site and Monument Commission on February 1, 2018, and the Savannah City Council on March 15, 2018. The action by the City Council was the final step in the approval process. During the dedication program, greetings were given by City Councilman Bill Durrence who represents the 2nd District where Chatham Square is located. Durrence said he was pleased to participate in this very long overdue recognition of one of our native sons. He reminded the group of Savannah dignitaries that Mr. Toomer’s financial efforts were fundamental to the success of much of the African American community for a very long time. Durrence added, “The marker is a well-deserved honor.” Elyse Butler, Outreach Coordinator for the Georgia Historical Society, told the group that she was honored to represent the Georgia Historical Society and likened Toomer’s accomplishments to those of other African American business trailblazers like Alonzo Herndon, founder of Atlanta Life Insurance Company. Vaughnette Goode-Walker, who provided the research and managed the application process for Carver State Bank, gave the group a few little-known facts about Toomer. She said it is appropriate that the Sundial Monument and the Historical Marker are both in Chatham Square, since this is the neighborhood where Toomer lived much of his life. She recalled that Toomer was one of the nation’s prominent business and civic leaders. He was appointed by President Dwight D. Eisenhower to serve as Register of the U.S. Treasury from 1953-1956. Prior to the unveiling and dedication, the text of the marker was read to the audience by Carver State Bank Community Reinvestment Act Officer and Internal Auditor Katrina-Moultrie Daniels. The program ended with a prayer of dedication and thanksgiving led by Bishop Willie Ferrell of the Royal Church of Christ. Carver State Bank was chartered on February 23, 1927, and was then known as the Georgia Savings and Realty Corporation. On April 29, 1947, the bank’s name was changed to The Carver Savings Bank. Louis B. Toomer remained President of the bank until his death in May 1961. As anticipated, Lawrence D. Perry became President following Toomer’s death. Under Perry’s leadership, Carver became a full-service commercial bank by adding new services, including checking accounts, and the bank’s name was changed to The Carver State Bank on February 5, 1962. On December 1, 1971, Perry retired from active management, and the Board of Directors selected Robert E. James to succeed Perry as President and Chief Executive Officer. Today, Carver is the oldest bank headquartered in Savannah, and one of only 22 African-American owned commercial banks in the United States. It is the only bank in South Georgia that is certified by the United States Treasury Department as a Community Development Financial Institution and the only bank headquartered in the area with an OUTSTANDING Community Reinvestment Act Rating.